While many funds and investors have been lowering their gold holdings after the huge rise in the price of gold in August, hedge funds are staying with gold. 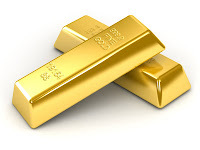 Hedge fund managers are apparently convinced that gold will still be profitable in an uncertain global economy with double-dip recession fears and the European debt crisis. Gold has dropped around 11 percent since the start of last week as liquidity-strapped investors scrambled to convert gold into cash amid fears over Greece's near-bankruptcy, likely hitting a number of hedge funds which have profited from its bull run in recent years. However, the yellow metal is still around 7 percent above its level at the start of July, and is up 14 percent this year, leaving long-term holders comfortably in the black for now. "I don't think... people who hold it as another currency... are changing their view," said Morten Spenner, chief executive of $2.8 billion fund of funds firm International Asset Management (IAM). "For some people who are long-term holders ... and who have banged that drum, they're likely to take it (the price fall)," Spenner said, adding that short-term market volatility that put pressure on the price of gold would not sway managers to abandon their positions.